Bah! I found another problem with something in Stokstad's recent Art History text. I promise that I'm not spending my time scouting out errors in this book - they just happen to pop up. I like a lot of things about Stokstad's approach to art history, but these minor errors and misleading statements are making me question whether I want to use this textbook for my classes. (Plus, it's making me wonder: what other incorrect or misleading statements in the text could have escaped my notice?) Man, if I ever decide to give up teaching, maybe Pearson Prentice Hall would hire me as an editor for their future editions of Art History. Right now I'm bothered about Stokstad's discussion of the Victory Stele of Naram-Sin (2254-2218 BCE, shown left). Stokstad writes about the significance of "the inscription" on the stele - which suggests that there is only one inscription.1 In reality, though, there are two inscriptions: one that was written by Naram-Sin, and another inscription (which is most prominent and recognizable) that was written about 1,000 years later. Not only does Stokstad fail to recognize that there are two inscriptions, but she also implies that the second (clearly visible) inscription is the one that was written to commemorate Naram-Sin's victory. This simply isn't true. 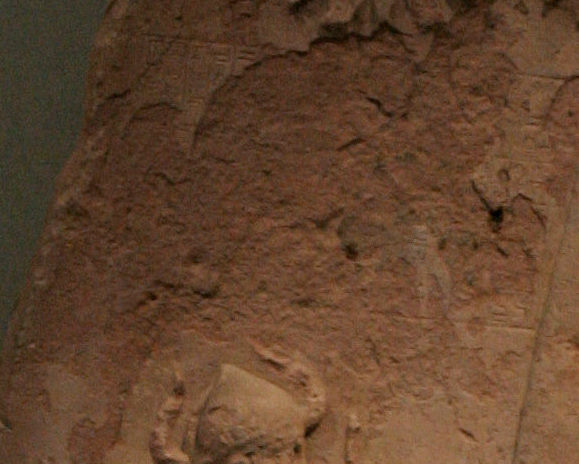 This inscription is partially worn off (it is outlined by a rectangular shape over Naram-Sin's head) and states that Naram-Sin was victorious over the Lullubi people of the Zagros Mountains. The inscription was likely made at the time when the rest of the stele was fashioned. This inscription was written by Shutruk-Nahhunte, an Elamite king who raided Sippar in the 12th century BC and carried the stele back to Susa as booty. Shutruk-Nahhunte recorded his actions in an Elamite text: "I am Shutruk-Nahhunte, son of Hallutush-Inshushinak, beloved servant of the god Inshushinak, king of Anshan and Susa, enlarger of my realm, protector of Elam, prince of Elam. At the command of [the god] Inshusinak, I struck down the city of Sippar. I took the stele of Naram-Sin in my hand, and I carried it off and brought it back to Elam. I set it up in dedication to my lord, Inshusinak." This week my class has been reading a fascinating essay by Marian H. Feldman which discusses this latter inscription. (It is because of Feldman's article that I noticed the misleading information in Stokstad's book. Only after sorting out the two inscriptions did I discover that the most recent edition of Gardner's Art Through the Ages correctly describes the two different inscriptions. At least one general survey text has the correct information!) Feldman uses the Elamite inscription as a springboard to discuss how different Mesopotamian monuments became loot and booty after multiple wars in the ancient Near East. She discusses the various ways that conquering Mesopotamian groups would mutilate or deface artistic spoils of war. It's a really interesting essay, and I especially like her comparisons between ancient looting and the 2003 raiding of the National Museum of Iraq. In regards to this stele, I liked Feldman's discussion of how Shutruk-Nahunte chose to associate himself with Naram-Sin in the second stele inscription. Feldman writes, "That Shutruk-Nahhunte did not overwrite or obliterate Naram-Sin's original inscription, as he did with other captured Mesopotamian monuments, and moreover, that in his own inscription he attributed the stele to Naram-Sin by name, suggests that this particular monument possessed a significance beyond simple war booty. Rather, Shutruk-Nahhunte's knowledge of the stele's association with a charismatic, if dishonored, ruler of the first great Near Eastern empire imbued the monument with added value. 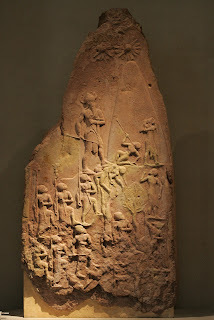 "2 It's neat to think about how the value and meaning of this stele has changed over time. Anyhow, thanks to Marian H. Feldman, I've now got my two inscriptions straight. Let's hope that Stokstad straightens out her own error in future editions of Art History. 2 Marian H. Feldman, "Knowledge as Cultural Biography: Lives of Mesopotamian Monuments," in Dialogues in Art History, from Mesopotamian to Modern: Readings for a New Century, Elizabeth Cropper, ed. (London: National Gallery of Art, Washington, 2009), 44.